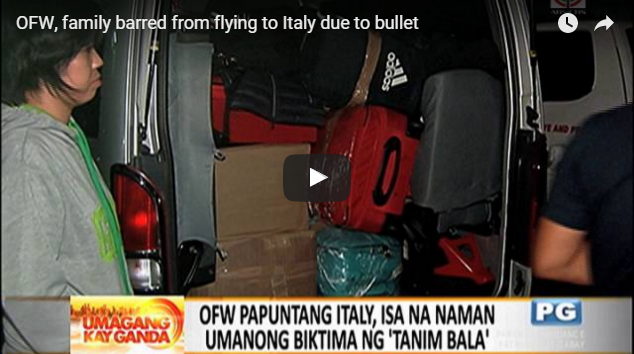 The “Laglag bala” scam affecting mostly OFWs continues to create fear for both local and international travelers. Just today, Monday January 11, another overseas Filipino worker (OFW) named Olivia de Guzman who supposed to go to Italy with her husband named Jovito and their 12-year-old child, were prevented to fly after a bullet was found in their belongings at Ninoy Aquino International Airport (NAIA) terminal 1. “A video from the Office of Transportation Security (OTS) shows de Guzman’s husband Jovito rummaging through the box and taking out the caliber .22 bullet from its bottom. The bullet was discovered after their luggage passed through an X-ray machine,” ABS-CBN reported. In an interview with dzMM, de Guzman admitted that she personally packed the box but denied putting the bullet inside. “I don’t believe in using bullets as amulets,” she added. De Guzman also said that authorities chose not to file charges to her or her husband after investigating the incident. The family will take the next flight to Italy although it wasn’t reported who covered their flight tickets. Well, it goes to say that getting in and out of the country still puts everyone at risk of being a victim. This is a problem that hasn’t exactly been solved despite being covered by media giants such as GMA, ABS-CBN and even some international news.